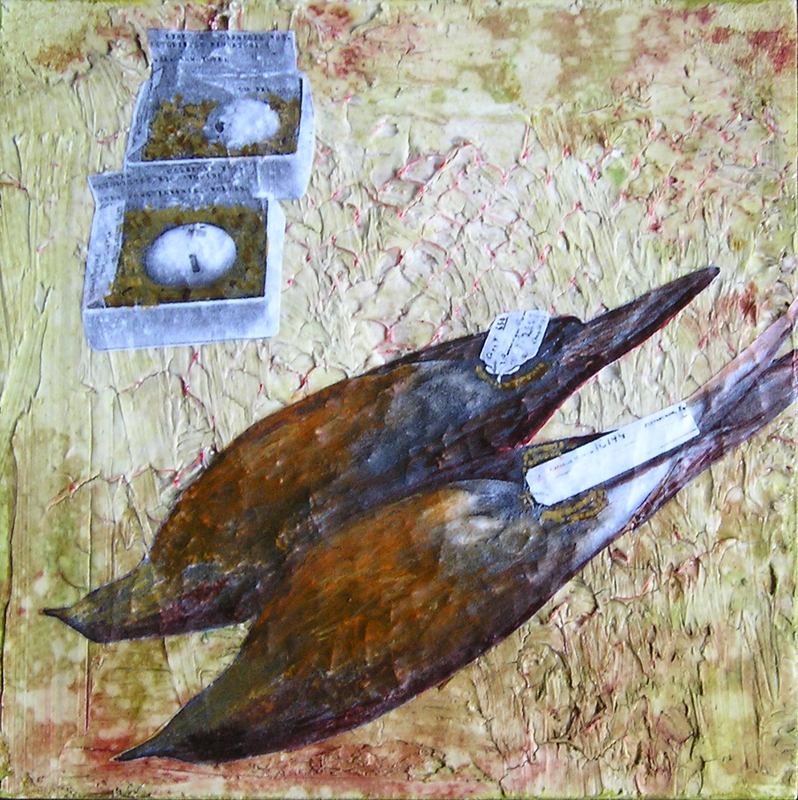 Moving Targets – A Reflection From A Century Passing | Patricia DeMarco Ph.D.
Art uniquely captures the complex responses surrounding the fact of extinction. Moving Targets juxtaposes the unintended extinction of the Passenger pigeon with the forced migration of Jews from Eastern Europe. These two interwoven stories show how fragile life is, for the abundant creatures of Nature, and ultimately, for humans as well. The beautiful Passenger pigeon, with its iridescent feathers and graceful form, assembled in enormous flocks for annual gatherings to mate and raise their young. When the European colonists arrived on the American continent, half of the land was covered with thick and diverse forests from coast to coast, with lush prairie in the middle. The Passenger pigeon flocks of three to five billion individuals coursed from north to south, swooping across the country, feasting on nuts and berries. The habitat was so abundant and diverse that a decade would elapse between visits. The birds’ challenges began with the settlers clearing forests for farmland, housing, and timber masts for the British navy. Between 1620 and 1920, the forested area fell from 50% to less than 5%, and 53% of wetlands were converted to other uses. [i] This massive loss of habitat affected the food supply, and the migratory circuit of the Passenger pigeons. The second most devastating challenge, was the ease of taking the birds for food. Their massive numbers gave protection against severe depletion by normal predators, so they did not have a well- developed instinct to fly from danger. From colonial times through the late 1800s, Passenger pigeons were hunted relentlessly to feed the growing population centers of the East coast. Birds were a cheap source of protein, selling at about a penny a bird, and enjoyed as “pigeon pie.” Once the railroads developed the capacity to ship birds across the country, millions were salted and shipped in barrels. The town of Plattsburg, New York, is estimated to have shipped 1.8 million pigeons to larger cities in 1851 alone, at a price of 31 to 56 cents a dozen. [ii] The birds’ reproductive patterns offered no defense against the unrelenting slaughter. Each pair produced a single squab, nesting at most twice in a season. Successful breeding depended upon large communal gatherings in nest sites that might cover 850 acres. In smaller groupings, as the numbers of birds began to decline in the 1860’s, reproductive success was less likely. Have we begun the accelerating decline from billions to few? How much of the living Earth can we destroy before we find ourselves on a planet inhospitable to life as we know it? The story of the Passenger pigeon gives us a chance to ask these questions, with the knowledge that even the most abundant of nature’s creatures falls to massive assault on habitat and reproductive stability. We can take this lesson of the Passenger pigeon: market forces alone will not solve a crisis. Concerned people raising their voices and standing together can change the course of history. The economic expediency and greed of the Passenger pigeon hunters assured their extinction. Refusing to address our own fossil fuel combustion habit, knowing that it is irreversibly compromising our atmosphere, may be setting the stage for ours. “Martha” can symbolize the clarion call to change. We can take actions that preserve the living earth if we realign our priorities and values to favor the resilience of the human spirit, the community of caring, the sense of wonder in nature. These values, beyond mere economic measures, make us truly human. These are the characteristics that helped people survive the unspeakable horrors of the Holocaust. The stories of survivors, global migrants in their passage, can inspire us in the face of disaster. We can place priority on the pursuit of knowledge, art and wisdom, the time spent in friendships and community, and the appreciation of the beauty of the natural world. If we value the quality of all of our lives over the quantity of our treasuries, we will preserve our life support system for our children – fresh air, clean water, fertile ground and the biodiversity of species with whom we are interconnected as passengers through time on this planet Earth. See http://atrart.net/moving-targets/ for a description of the Moving Targets project. [i] Status and Trends of the Nation’s Biological Resources. [ii] Schorger, A.W. (1955). The Passenger Pigeon: Its Natural History and Extinction. Madison, WI: University of Wisconsin Press. Page 145. .ISBN 1-930665-96-2. [iii] Kevin Hillstrom. 2010. U.S.Environmental Policy and Politics: A Documentary History. “President Roosevelt’s Address at a Conservation Conference of Governors May 13, 1908.” CQ Press. Washington D.C. Page 187. [iv] Linda Birnbaum, Ph.D., DABT, ATS. Director, National Institute of Environmental Health Sciences, National Institutes of Health, and Director, National Toxicology Program U.S. Department of Health and Human Services. “Testimony Before the Subcommittee on Superfund, Toxics and Environmental Health Committee on Environment and Public Works United States Senate.” February 4, 2010. http://www.epw.senate.gov/ Accessed March 10, 2015. Categories: Uncategorized | Tags: Conservation of Wildlife, Extinction, habitat, Holocaust, Living Earth, Passenger Pigeon | Permalink.